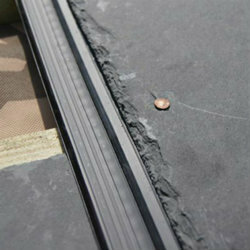 The Easy Slate Roof System is a low pitch roof system option that is simple, non-technical and easy to install. The return on investment is outstanding, delivering a staggering 200 to 500% improvement in performance, along with reductions in materials costs and environmental impact. The concept is simple to understand, being based on rubberised sealing strips which are fixed beneath the vulnerable perpendicular (perp) joins of the slates. The strips introduce a 1mm gap beneath each slate. This allows increased ventilation, and eliminates water ingress by capillary action. The effective lap is extended from the tail of the upper slate to the head of the slate beneath. The improvements in performance allow the system to be adopted on roof pitches as low as 12 degrees. Dubious about the claims made by Permavent? When tested on a 12.5 degree roof pitch to prEN 15601 ‘Resistance to wind-driven rain of roof coverings …’ by BRE, the system was found to remain 100% watertight in storm conditions. Currently the Easy Slate Roof System is a radical solution. Here at Ashbrook Roofing Supplies we believe that this, and similar solutions, will revolutionise roof construction in the UK. This product is particularly effective when used with Permavent Black, 50m x 1m breather membrane.